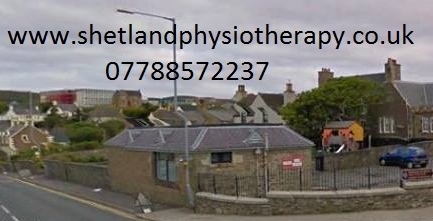 Shetland Physiotherapy gives a holistic and empathetic approach to physiotherapy helping People of all ages living in Shetland or Visitors to Shetland with a full Assessment, Advice and appropriate Treatment for a very wide range of conditions to ease pain and stress, improve function and achieve successful outcomes with long term benefits. Shetland Physiotherapy is a Private Physiotherapy Clinic at 31 King Harald Street Lerwick Shetland. Car parking and ramp at the door. Opening times are flexible – daytime, lunch-time, evening or week-end appointments are available on request. Work-related problems such as repetitive strain injuries RSI and postural problems; back, neck, joints and muscles problems, Children’s physiotherapy, Hydrotherapy / Aquatic Therapy, Learning Difficulties (Adults), Learning Difficulties (Children), ME/Chronic Fatigue Syndrome, Men and Women’s Health, Musculoskeletal problems, Neurology, Older people’s care, Orthopaedics, Pain management, Rehabilitation following Joint Replacement or other surgical procedures, Rheumatology, Sports physiotherapy, Stress management, Workplace health, Orthopaedic conditions like Frozen Shoulder, Tennis or Golfer’s Elbow, Hand problems, joint problems including chronic conditions, various forms of Arthritis, OA, RA, AS, Leg, Hip, Knee, Ankle and Feet problems, Works with Shetland Podiatry to offer Biomechanical Assessments to ease or prevent pain and dysfunction. Stress Management with Relaxation techniques, exercises and Massage Therapy techniques to help relieve pain, stress, anxiety and promote confidence, self-esteem, ability and function. Work-related problems early appointment can reduce or prevent sick leave from work. Early intervention helps improve outcomes hence self referral system in place with no forms to fill out prior to an appointment and no waiting lists to stress you.